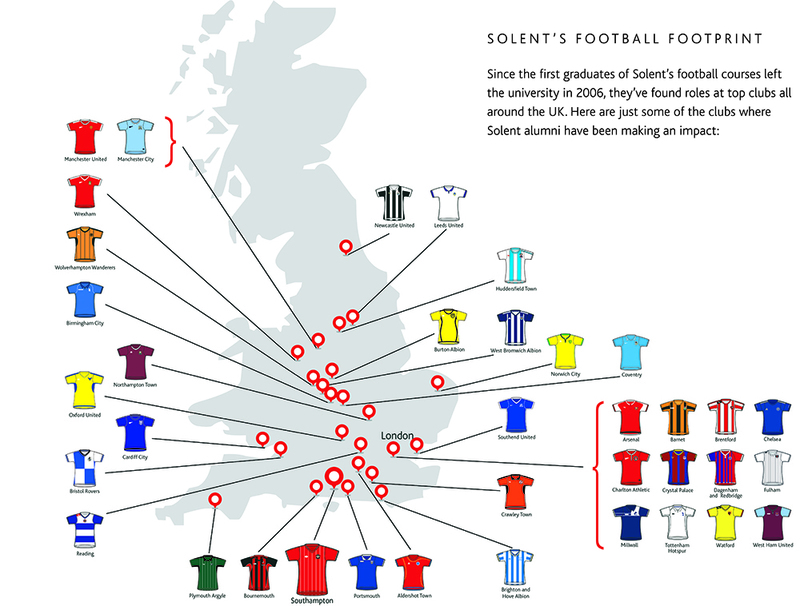 Solent University has been at the forefront of football education for nearly two decades, emerging as the UK’s leading supplier of graduates to football clubs and organisations. The industry’s rapid commercial expansion over the past 25 years has created a wide variety of new career pathways for those with the skills and enthusiasm required to succeed. Throughout the course you’ll be guided by an academic team with experience at all levels of the game. They’ve conducted major research reviews that have changed Premier and Football League regulations; won acclaim from UEFA for their football development work; and produced a number of published works on the subject. The curriculum offers a rounded business education, with all learning contextualised to the football environment. Modules cover marketing, management, football development, sociology, organisational behaviour and strategic planning. These themes run throughout the three year course, helping you to develop your general business skills alongside knowledge that is specific to the management of football organisations. In the final year of the course you’ll select an area of specialism. This will help you to better prepare for roles that match your personal ambitions, and will give you the chance to have an in-depth look at a side of the business you find most engaging. Employability skills are embedded throughout the degree, ensuring that you graduate well prepared to apply for relevant roles. Work experience is a core component of the 'Principles of Football Development' unit, which will see you working on leadership projects within the local football community. There is also a range of work experience and volunteering opportunities available through our network of partner clubs. Employability skills are embedded throughout the degree, ensuring that you graduate well prepared to apply for relevant roles. This football studies programme is open to students from a wide range of academic backgrounds. Football Foundation Year graduates will receive direct entry. Candidates should be passionate about football and the corporate world, aspiring to a career in administration, analytics, marketing or research within a professional club or sporting organisation. Students must purchase a Solent football kit. This is at a cost of approximately £105. Students are also required to undertake DBS criminal records checks as part of their enrolment. This is compulsory and comes at a cost of £10. The DBS check is organised by the University. Alternative entry to this course is available through the Football Foundation Year. You’ll be guided by an academic team who hold a wealth of knowledge and experience at various levels of the game. They have conducted research reviews that changed Premier League and Football League regulations; won acclaim from UEFA for their football development work; and produced a number of books and studies on the game. Graduates will leave the course with a range of skills that can be applied in any industry. These include graduate level proficiency in business, presentation, problem-solving, communication, IT, numeracy, people management, project management and critical thinking. The course is assessed using a combination of essays, written examinations, presentations, reports, case studies, poster presentations and research projects. If you are a student at one of our Erasmus partner institutions in Europe, then you may have the opportunity to come to the UK and study football and business units at Solent for either a single term or a full academic year as part of your degree programme. Take a look at a snapshot of some of the professional clubs Solent's football graduates have gone to work for. As a football business management student, you’ll have access to our full range of learning resources and facilities. These include a 24-hour library, comfortable study spaces, large computer resource centres and a comprehensive suite of academic and personal support services. Although students on football business management have no practical sessions, the delivery of football NGB qualifications are timetabled at the University's multi-million-pound football centre. Test Park is home to an all-weather 3G football pitch, an FA ‘Step 5’ football arena and a modern teaching space. The Times Good University Guide has recommended Solent University as a “leader in football-related academic study”. As with any large business, football clubs need staff with a variety of skills. Opportunities exist in marketing, project management, recruitment, administration, accountancy, partnership development and many other areas of business specialism. The University has provided administrative education for FIFA, the FA, the Premier League, the Football League and more than 60 professional clubs. This has helped us to forge and maintain long-standing relationships that have resulted in work placements, guest speakers and live briefs. A partnership exists with Southampton FC which provides, among other things, opportunities for students to gain work experience. A partnership also exists with the League Managers Association, who endorse the degree and provide prizes at graduation. We also run a Certificate of Higher Education in conjunction with this organisation. We run equality and diversity training nationally in partnership with Kick It Out, football's equality advisory body. You will be able to take this training free of charge. Football Development units are run in partnership with Hampshire FA, who support the development of unit content, contribute to the teaching on the unit and co-manage the UEFA award-winning Football Leadership Programme. Work experience is a core component of the 'Principles of Football Development' unit, which will see you working on leadership projects within the local football community. There are also work experience and volunteering opportunities available through our network of partner clubs. Past students have found work experience at clubs like Southampton FC, Reading FC and Aldershot Town FC.